Protecting biodiversity is vital to feeding a growing population. Yet, we're losing these resources every day. 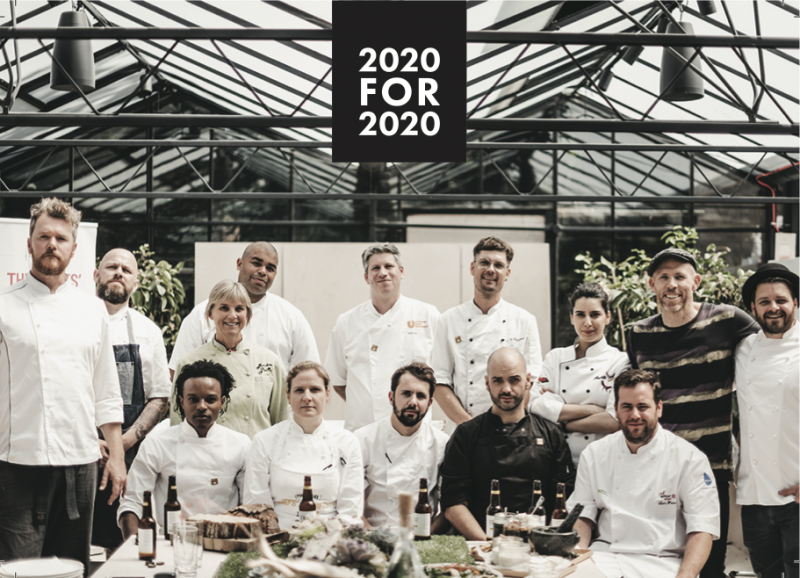 With biodiversity as a central issue identified in the Chefs' Manifesto, 2020FOR2020 calls on chefs around the world to champion food biodiversity in their kitchens and recipes for a more diverse, sustainable and delicious future. Get involved! 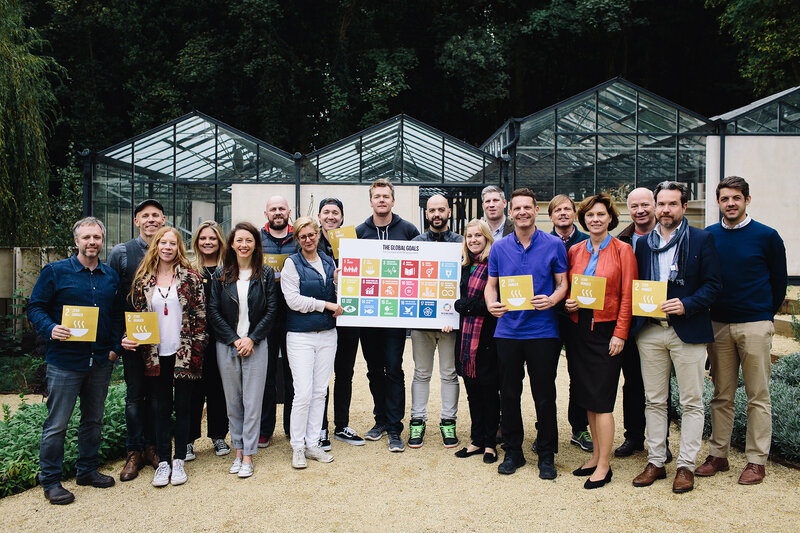 The SDG2 Advocacy Hub aims to build a community of chefs around the world, equipped with a simple set of actions to drive progress against the food issues that matter most to them. Working together we can help deliver a better food system for all. Join us. We believe in a better future for food. A future where ingredients are grown with respect for the environment, where no good food goes to waste and where everyone, everywhere enjoys the nutritious meals they need to grow and thrive. The good news is that, through the Sustainable Development Goals (SDGs), the United Nations have set out a roadmap to achieving this vision – and all 193 countries are on-board. But the journey is not going to be easy. Tackling food system challenges - such as undernutrition, food waste and soil degradation - is hugely complex. We believe that success relies on everyone rolling up their sleeves and getting involved. So, we need to start a new global conversation about food: An engaging, inclusive movement that will inspire people to come to the table and take action. And we see chefs at the centre of this conversation. Chefs bridge the gap between the farm and the fork – transforming raw ingredients into delicious, nutritious meals. In doing so, they influence what we grow, what we put on our plates and how we think and talk about food. We think chefs can be powerful advocates for a better food future – inspiring people to make changes in their kitchens and communities and empowering them to call on governments and companies to also play their part. 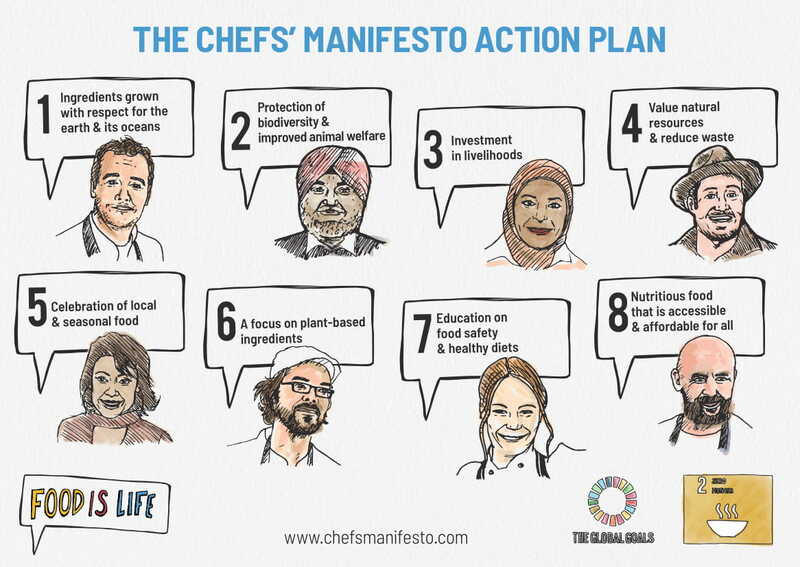 To facilitate this movement for change, the SDG2 Advocacy Hub worked with chefs all over the world to create a Chefs’ Manifesto- a thematic framework which outlines how chefs can contribute to the SDGs through simple, practical actions. 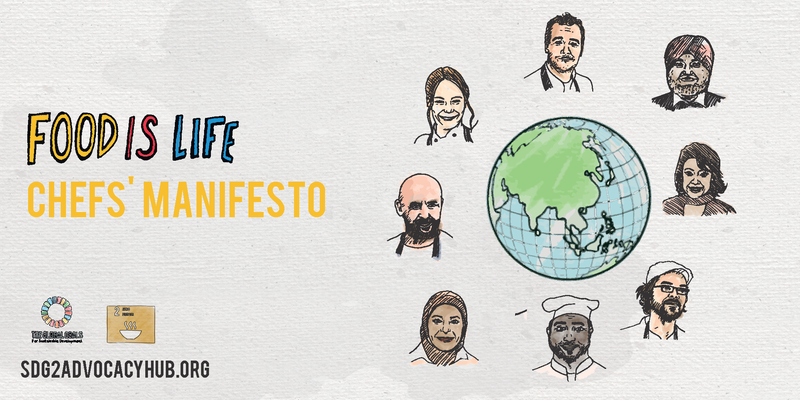 We wanted this to be a document written by chefs, for chefs so over the course of a few months, we asked chefs to tell us what food issues matter most to them - and the role they want to play in inspiring and influencing change. 100+ chefs from 36 countries contributed to this process - completing surveys, attending calls and participating in workshops in London, New York and Milan. 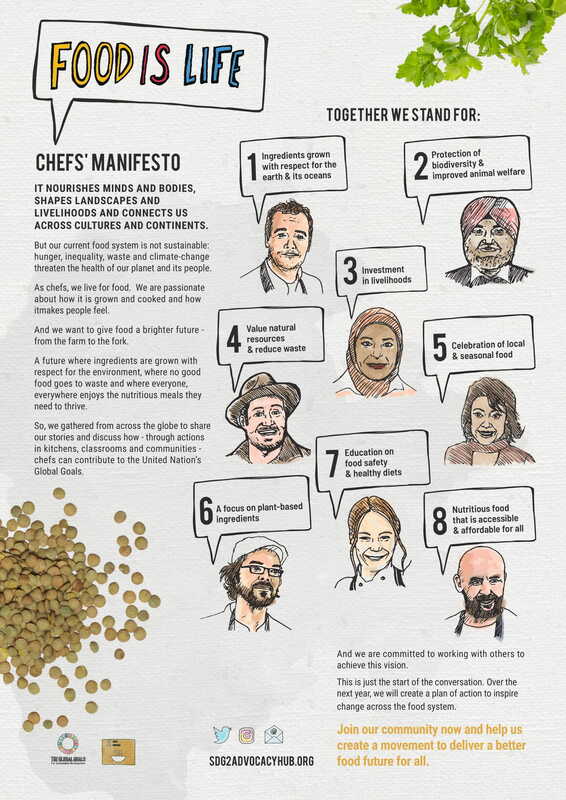 At the 2018 EAT Stockholm Food Forum, 16 chefs from 13 countries launched the Chefs' Manifesto Action Plan. Designed as a practical guide, the Action Plan details simple actions chefs can take in their kitchens, classrooms and communities to deliver a better food system for all. Download the Action Plan here. La version française de ce document se trouve a la fin de la page. Una versión de este documento en español está al final de la página. This is just the start of the journey. There is a lot of great activity happening already. 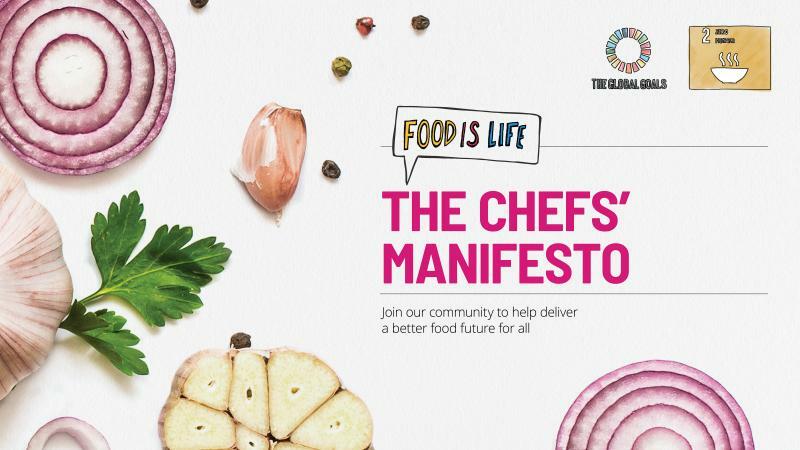 Through our chef community, we want to profile this work, share learnings and best practice, and help empower chefs everywhere to be SDG2 advocates. Contribute a recipe to "Cooking the Manifesto", a database compiling recipes in line with one or more of the Manifesto’s 8 thematic areas. 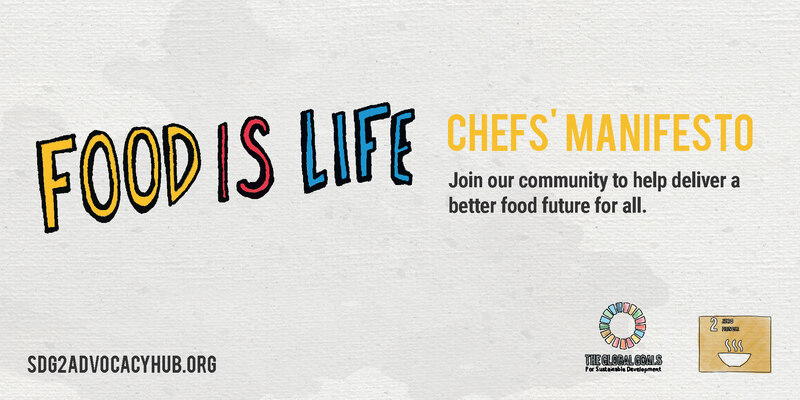 Join the Chefs' Manifesto community!